Today we pay our respects to Mona Tait and those who died 75 years ago today on 16 February 1942 in what is known as the Banka Massacre. In 1941, a nurse in her mid twenties, working in Canberra signed up for the Australian Army Nursing Service (AANS). Her photo at enlistment shows a fresh faced and smiling young woman. Mona Tait soon became immersed in the horrors of war and too quickly pay the ultimate price for her country. 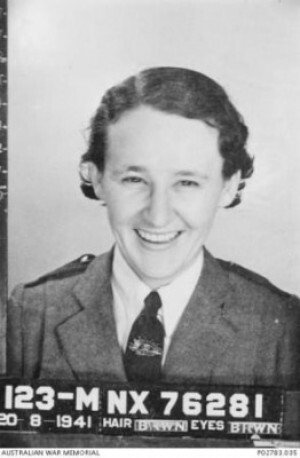 Sister Mona Margaret Anderson Tait trained as a nurse at Cessnock and was sister in charge of the X-ray department at Canberra Hospital for three years prior to enlisting in January 1941. She was attached to Victoria Barracks for eight months before being sent to Malaya where she nursed with the 13th Australian General Hospital at Malacca and Singapore. Mona was among the last 65 Australian nurses evacuated from Singapore on the SS Vyner Brooke on 12 February 1942. The Vyner Brook carried injured servicemen as well as civilian men, women and children. The Vyner Brooke was sunk by the Japanese off Bangka Island East of Sumatra, held by the Japanese. While some of the survivors attempted to arrange a surrender, 22 nurses remained on Radji Beach to tend the 60 wounded servicemen and crew. Japanese soldiers arrived at the beach and, after bayoneting the men, forced the remaining 22 Australian nurses and one British civilian to wade into the sea where they were shot from behind. Sister Tait was killed at the young age of 27. There were two survivors of the massacre, Sister Vivian Bullwinkel and a British soldier. Only Sister Bullwinkel survived the war and gave evidence of the massacre at a war crimes trial in Tokyo in 1947. Sister Tait and Sister May Hayman (a missionary nurse killed by the Japanese at Gona, New Guinea in 1942) were commemorated by a plaque at Royal Canberra Hospital. When the hospital closed in 1991 the plaque was removed to the Returned and Services League (RSL) Headquarters on Constitution Avenue in Campbell ACT. The RSL instigated an award - The Mona Tait and May Hayman Memorial Fund Scholarship - in which a prize of $350 is awarded annually, through the University of Canberra, to the nursing student with the highest results in the their first year of study. The Australian War Memorial has in its collection a letter written by Sister Tait to Anne Burrows, in Canberra, in February 1942 where she mentions meeting Frank Burrows, Anne's brother, who died as a POW on the Burma-Thai railroad. 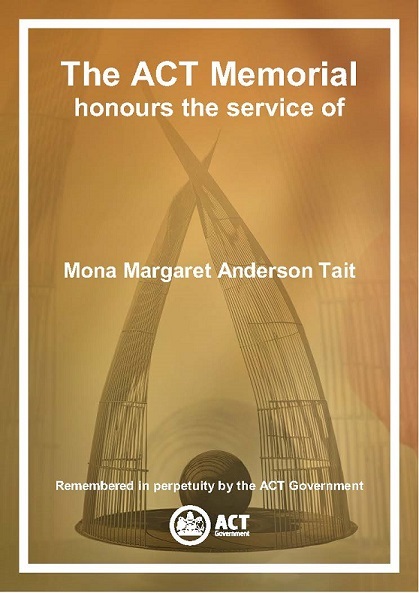 75 years on we especially honour the service of Mona Tait and those who fell with her.